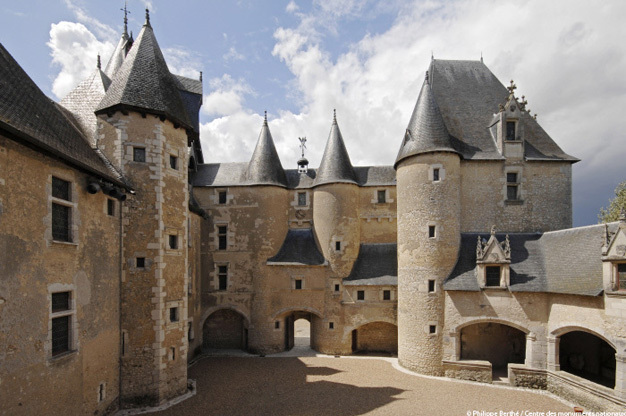 In 1030, the manor house of Fougères belonged to a vassal of the Count of Blois. During the Hundred Years’ War, the château fell into English hands, who abandoned it as a ruin in 1429. In 1470, Pierre de Refuge, advisor to Charles, Duke of Orléans and treasurer of King Louis XI, turned the château into a miniature fortress. In around 1510-1520, Jean de Villebresme, Pierre de Refuge’s grandson, modified the château by adding Renaissance-style décor and a covered gallery. In 1789, the château was acquired by René Lambot, owner of the neighbouring Château of Boissay. He turned the property into a spinning mill, which it remained between 1812 and 1901. The building was listed as a Historic Monument in 1912 and passed into the hands of the French state in 1932. The château of Fougères is an excellent example of a fortified château from the end of the Middle Ages. Despite the embellishments added during the Renaissance period, it differs from other, larger Loire châteaux by virtue of its lack of ostentatiousness.